In 2008, avid cyclist and triathlete Mark Fontenot took his passion for helping others “get in gear” and turned it into a business. The resulting Infinity Bicycles is a full-service triathlon and bike shop, offering tools of the trade for fun and leisure fitness, as well as gear and guidance for more serious riders, according to Katherine Taylor, who oversees marketing and inventory. To that end, Infinity Bicycles offers weekly leisure and road rides most Saturday mornings. The road ride, beginning at 8 a.m., averages 17 MPH over a 30 to 35-mile trek in and around Orange Beach. The leisure ride, offered at 10:30 a.m., is a ‘no-drop’ casual ride through the Backcountry Trail, meaning it’s only as fast as the slowest rider. 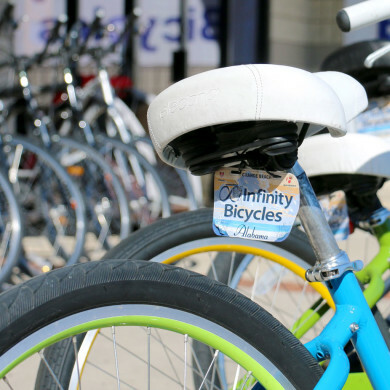 If you’re visiting town or trying out the sport, Infinity Bicycles offers bike rentals to suit your riding needs – from comfort to road bikes, as well as children’s cycles. The Gulf State Park is less than a mile from the store, so you can embark on your adventure with ease. In addition to sponsoring and promoting local events and triathlon series, Infinity Bicycles sells and repairs the finest cycles, and offers clothing and accessories. Popular brands include Trek, Electra, Sun Bicycles and more. The store includes a triathlon shop, where you can purchase everything you need to train or race under one roof. Infinity Bicycles is located at 4575 Orange Beach Boulevard in beautiful, bike-friendly Orange Beach, AL. Call (251) 974-1727 or visit the Infinity Bicycles website to get in gear.